Borough Wines was started in 2002, as a way to promote the wines of Chateau Ponchapt, our family vineyard in Bergerac. We began in our retail outlet in the heart of Borough Market. Our portfolio is mainly French but we are expanding our collection regularly - Our Italian selection has some recent new arrivals, and our New World wines are in a class of their own. This April we added a new shop to our family in Wilton Way, E8. The response has been fantastic and we thank you all for supporting our growth. …and because there is a limit as to how many wonderful wines you can source & share at Borough Market over 3 days, we are also supplying restaurants across London with our carefully selected portfolio. If you have a restaurant, bar, shop or deli and are looking for something a little different for the winerack, with a good quality/value ratio & environmentally friendly, then we believe we have wines to suit you. could become the leading bubbly. 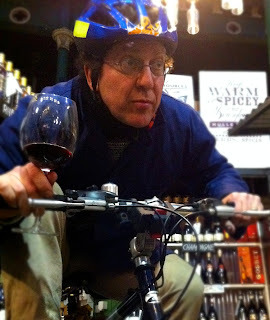 Borough Wines Legend Sebastian Peattie has signed up for the London to Paris 2011. He'll be cycling 230 miles over 3 days, 90 miles of which will be in one day, and it's all on behalf of The Big Issue Foundation. The Big Issue Foundation is dedicated to the well being of Big Issue Vendors, working with over 2900 individuals across the UK. Their skilled staff work one to one with vendors, tackling issues ranging from health and accommodation through to money management and aspirations. The Big Issue Foundation is about taking control, moving forward, gaining independence and rebuilding lives. They exist to enable vendors to continue on their journey away from homelessness. Did you know that life expectancy on the streets is only 46 years old? We've recently added 4 fantastic wines to our list, and had the wine maker himself, Guy Porter down at the stall in Borough Market to introduce them. Great reaction to all his wines throughout the day. Here's a little background to what they do and the wines they make. In 2002 the Porter family returned from the UK to New Zealand after many years away. Coming back to Canterbury in New Zealand's South Island to make their home at Bellbird Spring in the Waipara Valley. Bellbird Spring, Home Block Vineyard is 5.2 hectares in area. On a terrace above the Waipara river they have planted Pinot Gris, Gewurztraminer, Riesling and Muscat Ottonell on one hectare of this site to make Home Block White - their Vin de Terroir. Sauvignon Blanc is also planted and is used for 'The Pruner's Reward' label. Two years later and they bought another site. A clay slope to the north of the river which they named Block Eight. Sauvignon Blanc was planted here too, making a fuller old barrel fermented style. Pinot Gris was also planted, once again producing weightier wines than the Home Block terrace site. Each member their family plays a part. Tom and Sheila Porter have their home there and produce extra virgin olive oil from a grove on the Home Block. Their daughter, Alex, runs the company's office whilst their son Guy, (pictured) a winemaking graduate of Adelaide University, manages the vineyard and makes the wine. Lying 60 kilometres north of Canterbury in New Zealand’s South Island, the Waipara Valley enjoys a cool climate with low rainfall and long, sunny autumns. This dry, ‘Indian Summer’ allows their fruit to ripen slowly during a long growing season with remarkably similar conditions to those found in Alsace. On the Home Block - soil is classic alluvial bench and their vines have sunk their roots deep into the Glasnevin gravels of the Waipara Valley terraces. In these poor, free-draining soils vine vigour is naturally restrained, yields are low, and the plant maintains an innate balance between vegetation and fruit. Block Eight is composed of stoney, sandy Domett clay. It is warmer than the Home Block and ripeness comes a little earlier. Nevertheless, much manual work remains. Leaves are plucked to expose the fruit to the sun, fruit may be thinned to balance yield with concentration. Once each harvest is complete they return again in the winter to prune and then, with spring, the cycle of work and growth begins again. Winemaking at Bellbird spring is typified by hand harvesting, wholebunch pressing of white varieties or hand plunging reds. Wines are generally naturally fermented or aged in old oak barriques, refecting an artisan style. They craft small lots from individual vineyards alowing the identiy of their site and vintage to express itself. Last week, Lebanese wine maker Faouzi Issa from Domaine des Tourelles dropped in to sample some of his wines with us and our customers! Was a great few hours watching him pass on his passion & knowledge to the customers and staff of Borough wines. Domaine Des Tourelles are the oldest commercial vineyard in The Lebanon, producing fantastic wines, and we have just secured exclusive rights to distribute his wines in London. This weekend we are tasting wines from Mendoza, Argentina and also a top end Gigondas from the Rhone. The Zolo Cabernet Sauvignon and Zolo Chardonnay are produced by Bodega Tapiz. Their wines come from carefully selected vineyards located in the terroir of Agrelo and Valle de Uco, both in Mendoza. Flanked by the imposing Andes, these vineyards are subjected to unique bio-climatic characteristics, thus making it a unique terroir for winemaking. The grapes harvested there reflect the perfect, alluvial enriched soil combined with an ideal exposure to sunlight and an incredible temperature range which persists throughout the summer. The Reserve Chardonnay has a soft golden colour with green flashes. The nose is complex and intense, with notes of pear, apple and a hint of mineral. Good integration with vanilla provided by the French oak with a final intense and persistent. Jam pecked with ripe cherry and boysenberry fruit. Notes of spice and dark chocolate. It has good length and good balance between oak and fruit. Top wine from La Cave Gigondas, this big and powerful Syrah and Grenache has an incredible complexity. Plenty of black fruits aromas. Nose of a great aromatic richness, strawberries, tobacco and pepper. The entry is elegant, delicate and racy. A long maturing can smooth and melt the tannins. The palate is rich and well balanced. Ends with a lingering finish. Prune and cherries retro-olfaction. This week we are tasting three Brazilian wines. They all come from Rio Grande do Sul, the Southern state of the country. Miolo (www.miolo.com.br/en) is an Italian origin family producer that has been making wine there for more than 100 years. Wine from the Campanha - one of the newest wine regions of Brazil and probably the best for cultivation of red wine grapes. This Pinot Noir displays average intensity of colour with shades of red ruby and violet. Good intensity aromas, very fine and delicate. The taste comprises a mix of raspberry, blackberry, strawberry, plum drought, spices and chocolate. Wine of medium body and sweet and velvety sensation in the mouth, with balanced tannins. Also from Campanha, this amazing wine made of Portuguese grapes (Touriga Nacional, Alfrocheiro and Tinta Roriz) confirms the suitability of this terroir. Good colour intensity, with tones ranging from ruby red to purple. Typical aroma of Portuguese varieties, with good intensity and persistence of raisin, fig, strawberry, chocolate, prune and fruit preserve. Balanced in the palate, with expressive body and soft rounded tannins with a lingering pleasant finish. Come to Borough Wines and check it out! Barolo is such a "serious" and "powerful" wine that it's hard to make time for it- let alone an appropriate meal for it. There is a good chance that you remember the last time you had some, as it is the type to leave an impression with the wine drinker. Barolo Rochette 2004 is a classic Barolo, made in an outstanding vintage. Gorgeous aromas of roses, truffles and orange peal underneath all the Barolo firmness. Medium bodied with a lengthy finish of tea, chocolate and Oaky tones. Ideal with spring lamb! Spanish Wines this weekend - Ole! Speak of Spanish wines and the wines of Rioja are what first come to mind but Spain has plenty of other offerings. They are famous for their reds but they also make some excellent whites and not just albarino. This weekend we will be featuring the white wine of theSpanish organic producer Garmendia in the Castillo y Leon region of Spain and a lovely malvasia from the producer Arribes. Garmendia has been producing organic wine for the past 10 years and although a young producer the wines coming out of their vineyards are top quality. Their Garmendia 2007 white is a careful blend of verdejo and viura. A full and lively wine, it has plenty of citrus character to it with a smooth mouthfeel and a limey finish. This is the perfect wine to have with believe it or not sushi or teriyaki. I had it the other night with dinner and it was the perfect companion. £10 at the market stall. Another tasty white from Salamanca, the Arribes 100% malvasia is a fine, rounded example of this varietal. On the nose it is full of citrus, very fresh, grapefruit driven, clean and crisp. Great with chicken, creamy dishes, paella and for the price of £6.50, it really delivers. 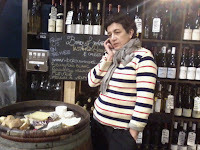 We've also got a rose from the Cotes du Luberon and a lovely, jubbly Beaujolais cru, the Fleurie from Domaine Monrozier. The greatest success story of the last month would have to be the barrels of wine that has the streets of Hackney talking.. 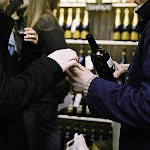 In a period of austerity, the refill-option of quality bulk wine has become a hit with the locals of E8, and you can hear the chiming of the empty bottles along the street as people walk for re-fills. The happy sound of summer! We're in the process of building an online store where you can buy all of the delicious wine you have sampled at our stall at Borough Market, delivered to you door. Meanwhile, you can order by emailing us on orders@boroughwines.co.uk, we will then call you to take payment over the phone. We also offer a 10% Discount on a case of 12. Local delivery is free, and will ship to the rest of the UK for £12.00 per case.